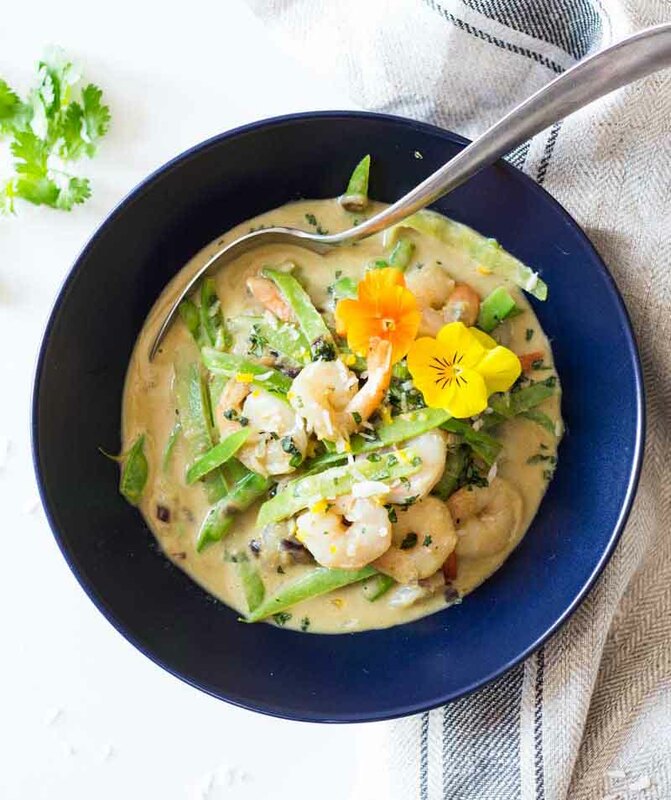 A healthy and easy Thai Green Curry with Shrimp whipped up in only 20 minutes. How about that? Perfect for weeknights when you don’t want to spend too much time in the kitchen. The easiest Thai Green Curry ever! I love quick and easy recipes with minimal cleanup requirements, especially if they can then be enjoyed outside, and that’s why I have this deliciousness for you today. All you need is 7 ingredients, 1 pan, one chopping board, one knife, and one spatula for some occasional stirring. That’s it! 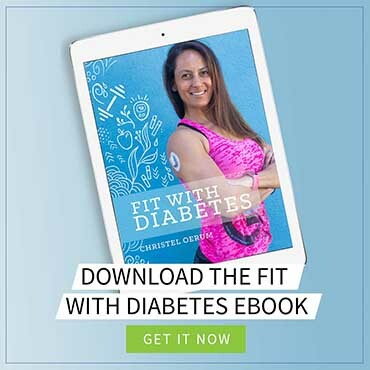 No complicated steps, just some simple straightforward cooking and you will be rewarded with an amazing and healthy dinner that you will most likely put on your weekly meal plan from now on. This is a recipe that anyone can make! Step 1: Heat a teaspoon of olive oil in a pan or cast iron skillet over medium heat. Add chopped onion and crushed garlic and sautée for a couple of minutes. Step 2: Add coconut milk, green curry paste, and fish sauce. Allow to simmer uncovered for about 10 minutes, or until most of the coconut water has evaporated and the sauce is nice and creamy. Step 3: Wash the snap peas and snap them lengthwise to speed up cooking time. Step 4: Add the snap peas to the coconut curry sauce and cook for about 1 minute. Step 5: Add shrimp and cook for 30 seconds. Super simple and ready in about 20 minutes! Just make sure to serve it right away as it’s not a dish that keeps very well. Even though it has that yummy creamy feel from the coconut milk, it doesn’t feel heavy at all, which is backed up by the fact that one serving only has 228 calories. 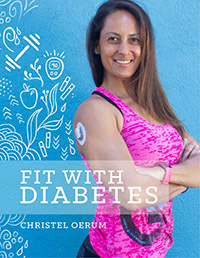 With 26 grams of protein packed into those calories, it’s a recipe that works perfectly for a fitness girl like me! Shrimp are full of protein and very low in fat, which makes them an excellent source of protein. However, if you don’t like shrimp, you can use small pieces of cooked chicken breast instead. The preparation is exactly the same. Just add your protein to the pan for the last 30 seconds of cooking so the pre-cooked chicken can absorb some of the curry flavors. The coconut milk, green curry paste, and fish sauce give the curry that distinct Thai flavor we all love and pay for at our favorite Thai restaurant. You can eat this Thai Curry with Shrimp just as it is or you can serve it with rice, cauliflower rice, or zucchini noodles. Having some healthy carbs to absorb the curry makes the dish even better. I am a big fan of quick and healthy seafood recipes. If you want to try another healthy shrimp recipe, try the Grilled Shrimp Skewers with Creamy Chili Sauce! It’s one of my absolute favorite summer grilling recipes. If you prefer a delicious fish recipe where you don’t even have to turn on the stove, take a look at the Ahi Tuna Poke. It’s my go-to starter for when I have guests over and want to serve something looks really impressive (and tastes AMAZING) without spending a lot of time in the kitchen. 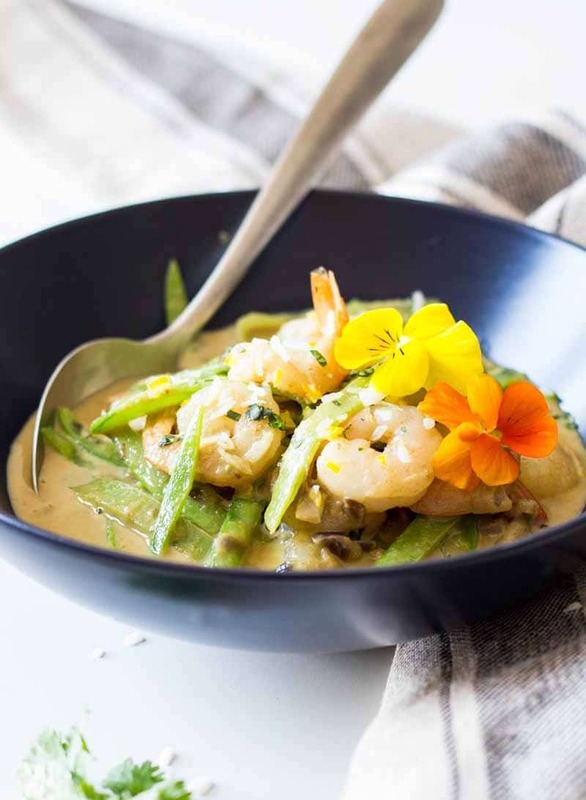 When you’ve tried the Thai Green Curry With Shrimp, please don’t forget to let me know how you liked it and rate the recipe in the comments below! 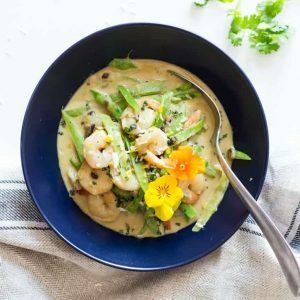 A healthy and easy Thai Green Curry with Shrimp whipped up in only 20 minutes. Heat a heavy bottomed pan or cast iron skillet over medium heat. Once hot, add a tiny splash of olive oil to the pan. Add chopped onion and crushed garlic and sautée until translucent. Add coconut milk, green curry paste, and fish sauce. Allow to simmer uncovered for about 10 minutes, or until most of the coconut water has evaporated and the sauce is nice and creamy. Wash the snap peas and snap them lengthwise to speed up cooking time. Add the snap peas to the coconut curry sauce and cook for about 1 minute. Add shrimp and cook for 30 seconds. Made this yesterday and it was great! I used regular peas rather than snap peas.